Raise your hand if you desperately need a date night with your honey, but are dreading how expensive it's going to be. Yeah, there are lots of us out there! 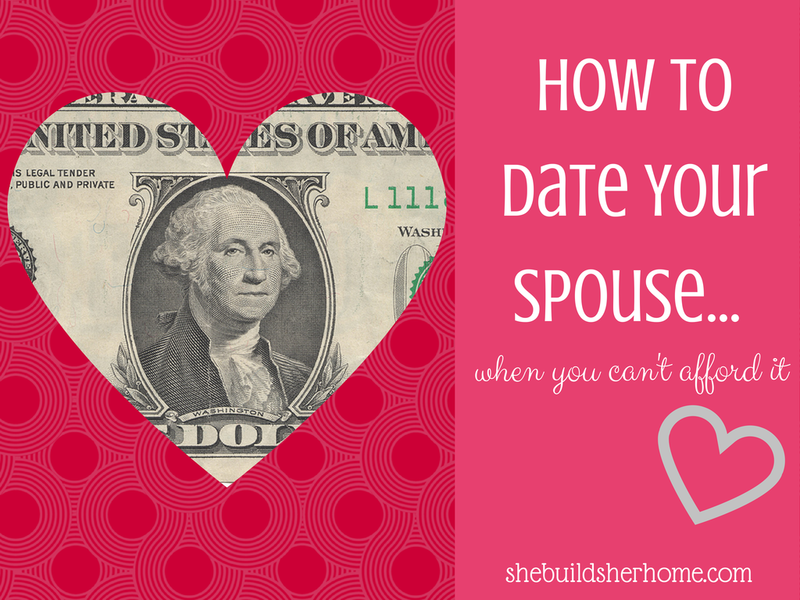 I will be the first to admit that my husband and I need to be better about dating. It's so easy to get caught up in the hubbub of life and not take focused time for each other. Then when you add kids to the mix, there's a whole other dimension there. Not to mention the added expense of child care! Here are a few tips I have for dating on the cheap. Let's get the babysitting thing out of the way. I know that we are extremely blessed in this area, and not everyone has these options, but I honestly cannot think of a single time in almost 3 years of parenting that I have paid someone to watch my kids. We are constantly blessed with friends and family who want to watch our girls. But that hasn't stopped us from getting creative. If you don't have people around who can sit for you, try to swap child care with another couple! We have done this with another family several times and it's so much fun! We will watch their kids for an evening or event, and then they return the favor another time. This way, two couples get date nights, it's free, and the kids have a blast, too! If that's still not an option for you, see tip #2. Stay in. There are so many fun things you can do for date night's in. I think the big difference is that you are being intentional about spending that quality time together. I know my husband and I can spend 3 nights a week together and hardly connect sometimes. It's all about taking the time to focus on one another. We've decided to make it a point to have one night a week where we either go out on a date, OR after our kids go to bed, we put aside computers, phones and other people to spend time with each other. Head outdoors. Isn't there just something about the great outdoors that can make a date extra special? It just never feels like an ordinary date when you are outside. At least for us! The really great thing about outdoor dates is that they are often free or really cheap! Here are a few ideas for dating outside: pack a picnic and eat it in a park, or grab take out and go find a picnic table or throw down a blanket in the park; build a fire, roast marshmallows and just enjoy being together; star gaze; go on a hike; borrow kayaks or a canoe from a friend and head to a local lake; head out on a long bike ride; check out a farmer's market; find a concert in a park. Ask for gift cards or memberships as Christmas and birthday gifts. I feel like my husband and I are constantly scratching our heads when our parents are asking us for gift ideas. Asking for gift cards to go out to dinner, tickets to a concert or event, a membership to a museum you like, or a coupon book for places around town would be an easy way to save on dates, or go on them for free! What could be a better gift than spending time with your love?! Skip dinner, get dessert. I can't take credit for this tip, as it is something a friend shared with me years ago. If you don't want to spend a ton of money on dinner, but still want to go out, get dressed up and go to a fancier restaurant for dessert! Most of the time, my husband and I share dessert if we get it, because we can't ever eat a whole one ourselves, so we save even more when we do this. Before we had kids, sometimes we would go out for appetizers and dessert instead of dinner. Somehow it made it more fun to eat spinach artichoke dip and cheesecake for dinner! What are some ways you save on date nights? They can get expensive really easily! Love these!!! I'm coming over from "The Peony Project" I just noticed you updated the blog directory over there and I was like "OHHH, someone new!" lol! Had to check it out! :) love the blog!